Agate Cove Inn 11201 N. Lansing St., (800) 527-3111, (707) 937-0551. Unsuitable for children under 12. No TVs; some fireplaces. Hot tub. Cookies; full breakfast. 10 rooms. Located up on a bluff at the edge of town, this comfortable inn’s single and duplex cottages are spread out on 2 acres. 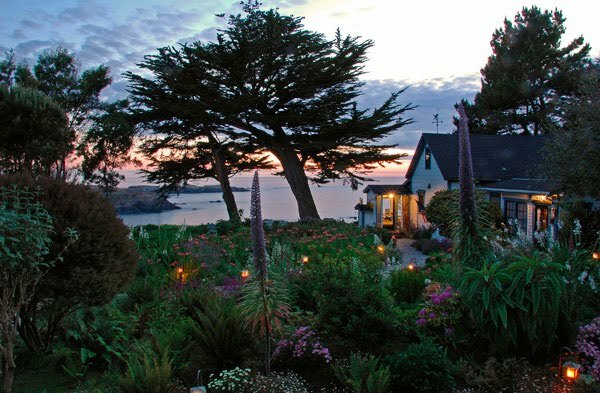 Two rooms are in a cozy 1860s farmhouse, as is the breakfast room overlooking Agate Cove and featuring a stunning ocean view. Breakfast entrees are often cooked on the kitchen’s 100-year-old Belleville wood stove, and a tray can be delivered to the room. Most rooms have an ocean view, but the Sunstone room has a little porch, bed, and bathtub--all with ocean view. This inn truly is stunning!